Two Sheboygan UnitedOne offices undergoing renovations! 2122 Superior Ave. & 3509 Washington Ave. Please check this page for updates and new developments throughout the remodeling process, which will enhance the member experience and streamline services. Your patience and understanding is greatly appreciated. 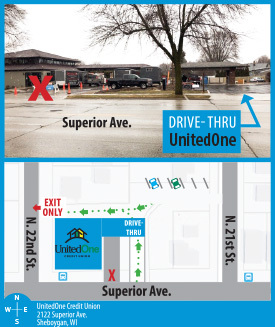 We have a new drive-thru entrance at our Superior Avenue branch in Sheboygan. Please use the entrance pictured on the far right instead of the previous drive-thru entrance on the left. The upgrades at Superior Avenue will allow for extended drive-thru hours in 2019! Our Superior Ave. location is experiencing extensive updates to the inside and outside of the branch. 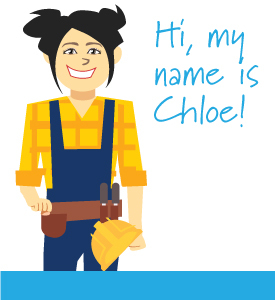 If you would like to avoid the construction there, please use one of our other Sheboygan branches on Washington Ave. or N. 8th St.
*FIND* Chloe Construction at one of our other Sheboygan locations and enter to win a $20 gift card to an area business. >The parking lot immediately west of the drive-thru will be temporarily unavailable as the renovation process continues. >Street parking is available on Superior Ave. and N. 22nd St. to access the branch. >Please use caution when entering and exiting the branch, as construction materials may obstruct some walkways. >The drive-thru remains open, but please note to use a new entrance on Superior Avenue. >Members will notice the lobby of this branch has received new flooring. Stay tuned for more updates that will take place in the upcoming months. We're here because you're here! © UnitedOne Credit Union 2016. All rights reserved.